In addition to the Nonsubsistence use areas listed below other specific areas are closed to subsistence and/or personal use fishing. For specific information on closures contact the local ADF&G office. 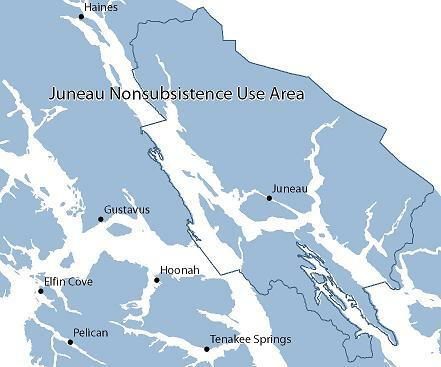 The Juneau Nonsubsistence Area is comprised of the following: within Unit 1(C), as defined by 5 AAC 92.450(1) (C), all drainages on the mainland east of Lynn Canal and Stephens Passage from the latitude of Eldred Rock to Point Coke, and on Lincoln, Shelter, and Douglas islands; within Unit 4, as defined by 5 AAC 92.450(4), that portion of Admiralty Island that includes the Glass Peninsula, all drainages into Seymour Canal north of and including Pleasant Bay, all drainages into Stephens Passage west of Point Arden, the Mansfield Peninsula, all drainages into Chatham Strait north of Point Marsden; all marine waters of Sections 11-A and 11-B, as defined in 5 AAC 33.200(k) (1) and (k)(2), Section 12-B, as defined in 5 AAC 33.200(l) (2), and that portion of Section 12-A, as defined in 5 AAC 33.200(l) (1), north of the latitude of Point Marsden and that portion of District 15, as defined in 5 AAC 33.200 (o), south of the latitude of the northern entrance to Berners Bay, and including Berners Bay. 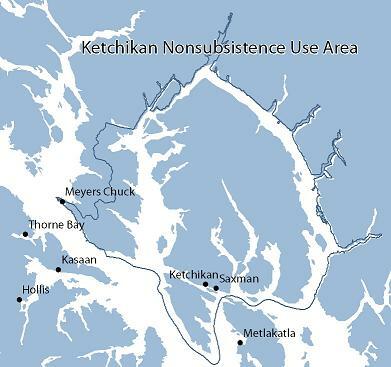 The Ketchikan Nonsubsistence Area is comprised of the following: within Unit 1(A), as defined in 5 AAC 92.450(1) (A), all drainages of the Cleveland Peninsula between Niblack Point and Bluff Point, Revillagigedo, Gravina, Pennock, Smeaton, Bold, Betton, and Hassler Islands; all marine waters of Sections 1-C, as defined by 5 AAC 33.200(a) (3), 1-D, as defined by 5 AAC 33.200(a) (4), 1-E, as defined by 5 AAC 33.200(a) (5), that portion of Section 1-F, as defined by 5 AAC 33.200(a) (6), north of the latitude of the southernmost tip of Mary Island and within one mile of the mainland and the Gravina and Revillagigedo Island shorelines; and that portion of District 2, as defined by 5 AAC 33.200(b), within one mile of the Cleveland Peninsula shoreline and east of the longitude of Niblack Point.